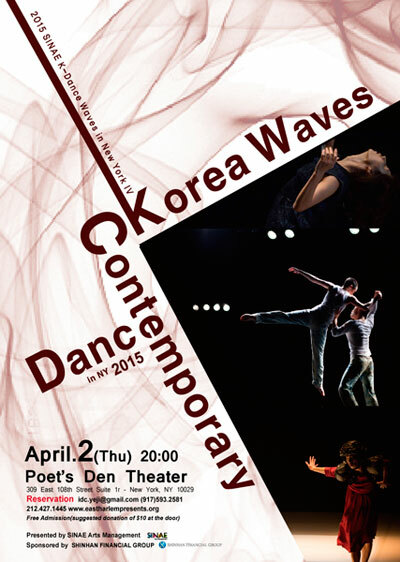 SINAE Arts Management presents ‘K-dance (Korea Contemporary Dance) Waves in New York 2015.’ K-dance Waves in NY has been working to represent and introduce the great works of Korea dance companies in New York each year. This year, for the 4th edition of K-dance waves in NY, the SINAE Arts Management presents three special performances choreographed by renowned artists from Korea: ‘<For whom> by Project S (choreographed by Suk Soon Jung)’, ‘<Puri – unravel 2015> by Dance Project Tan tantan dan (choreographed by Jin Han Choi)’ and ‘<Pretense II> by BK Dance Project (choreographed by Bo Kyung Lee)’. For more information, please call at 82-70-7558-5710 (Korea) or 917-593-2581(NY), or email to idc.yeji@gmail.com. To RSVP, please visit http://www.eventbrite.com/e/k-dance-waves-in-new-york-tickets-15907005281.